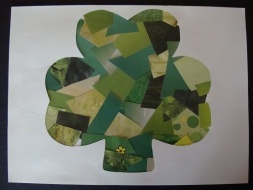 This Shamrock Collage is a perfect craft for preschoolers, on up, to help them celebrate St Patricks Day! They may need help cutting the shapes, but they'll love to see their own Shamrock appear! 1. From your magazines cut out anything that's green! If you don't have any magazines just cut shapes from different colors of green construction paper. 2. Start gluing your green shapes all over a white piece of construction paper. Cover as much of the paper as you can. 3. Cut a big shamrock shape out of another white piece of construction paper. Glue it over top of your green shapes collage, and you've made your own unique shamrock! Instead of cutting one big shamrock shape you could also cut out smaller shamrocks to lay on top of your collage, be creative!